Ötzi the Iceman: In a study published in the Jan. 8, 2016, issue of the journal Science, researchers from the Moritz group at ISB collaborated with a worldwide consortia headed by Prof. Albert Zink and Dr. Frank Maixner, of the Institute for Mummies and the Iceman at the European Academy of Bozen/Bolzano (EURAC) in Italy; Prof. Thomas Rattei, of the University of Vienna; and Dr. Rudi Grimm, of University of California-Davis to identify and sequence the entire genome of a Helicobacter pylori pathogenic strain of Asian origin in the stomach contents of the mummified 45-year-old male named Ötzi. Q: Would you describe the project? 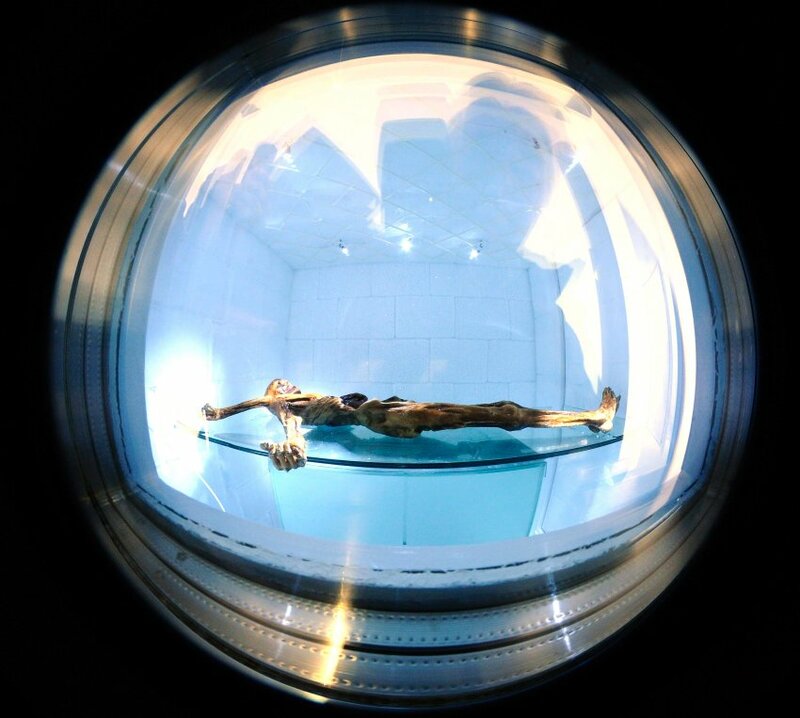 A: ISB collaborated with researchers worldwide to study pathogens in the stomach content and microbiome of the 5300-year-old European Copper Age glacier mummy “Ötzi” (pictured above). The consortium discovered a Helicobacter pylori pathogen genome. Ötzi harbored a nearly pure Asian-origin bacterial population of H. pylori, providing key information related to population migration into Europe over the last few thousand years. H. pylori is a bacterium found in 50 percent of all humans today. This finding provides a theory that humans were already infected with this stomach bacterium at least 5000 years ago and its presence at the very beginning of history could well be true. Q: How did your lab get involved in the project? A: Through long standing collaborations with Rudi Grimm, I was approached to provide expertise how one would tackle a proteome of mixed organisms and very degraded samples and were then invited to tackle this problem where it was revealed that it was Ötzi. This was a real surprise and a highlight as this is such a rare event, it continues to be an honor for us at ISB to be part of the Ötzi. analysis team at EURAC. Q: What was your lab’s role? A: We used high-sensitivity proteomics techniques and applied a multi-step solubilization and fractionation protocol to identify human proteins in the stomach metaproteome, of which are either highly expressed in the stomach mucosa, or present in the gastrointestinal tract and involved in digestion. Proteins involved in immune processes observed in the Iceman stomach proteome are normally primarily expressed in neutrophils, are involved in the inflammatory host response, and correlate well with proteomes of inflamed gastric tissues of modern H. pylori–infected patients. Thus, the Iceman’s stomach was colonized by a cytotoxic H. pylori–type strain that triggered host inflammatory immune responses. From my group, Drs. Michael Hoopmann, Janice Hallows and Ulrike Kusebauch used their biochemistry and mass spectrometry expertise to collaborate with our research colleagues to develop methods for the broad identification of proteins extracted from this ancient sample of a mixture of food remnants, human proteins and microbiome ecologies within the stomach of Ötzi. The difficulty in extracting proteins from this desiccated sample is due to the degradation of proteins of both the stomach environment and of sheer time. However, the team at ISB found that proteins were surprisingly preserved over the 5300 years that Ötzi was entombed in glacial ice high in the Ötztal Alps on the border of Austria and Italy. In-depth analysis of stomach proteome supported the evidence of severe pathogen infection and ongoing analysis will reveal more aspects of the final days of Ötzi’s life. Q: What’s the significance of this research? A: The intense study of Ötzi over time is revealing many challenges to life in the European Copper Age. We found now that Ötzi was infected with H. pylori, which is in addition to the recently revealed infection with Lyme disease, which was discovered in Ötzi through the re-analysis of his genome which revealed Borrelia sequences. His challenges did not cease at just pathogens. Ötzi had worn joints and terribly worn and infected teeth, and he was killed, likely, from falling after being shot in the collarbone by an arrow. Since bacteria are usually transmitted within ones family, the history of the world’s population is closely linked to the history of bacteria. Up till now, it had been assumed that Neolithic humans were already carrying this European strain by the time they stopped their nomadic life and took up agriculture. Research on Ötzi, however, demonstrates that this was not the case.